the activite is very good . it is fun and dictraccion . hello i am marta and i think that the blog is very funny and i think that is very interesting becuause i don't knowed that why we celebrated halloween. hi teacher!! i did the exercises. the exercises are interesting. I didn`t know that the halloween is origined from the celtics. I thought a nice activity to learn more of this beautiful celebration that is Halloween. 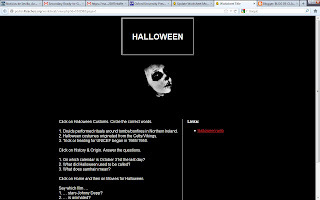 Hi, I think that this activity was interesting because i learnt some things about Halloween's origin. It was so easy. This activity is very interesting, because i study the origen of Halloween. I don't celebrate Halloween because i don't like. Hi teacher! I like this activity because I can discover the halloween´s origin. I don´t know that the halloween was a celta´s costum. Hi teacher, I´m Jorge and i think that this activite was very interesting and i learnt some some things like the halloween´s origin. hi teacher! I´m carlos and i think that the activity was interesting and easy. Halloween isn´t bad but christmas is better.